In 1881, Garfield County was established and named in honor of President James Abram Garfield, a powerful preacher and educator among the Stone-Campbell Movement of churches. He was our first left-handed president and he had an even-handed view of the Lord's Church. Joseph M. Pomeroy platted this town in 1878 and named it after himself. About that time Jacob People Hastings, a circuit riding preacher, was involved in gospel preaching in the new town. 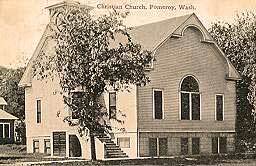 His exact role is not clear, but he was among the signers of the Articles of Incorporation for the Pomeroy Christian Church. Mr. Hastings also served as Justice of the Peace and owned several business enterprises. Mr. Hastings reported to the Christian Standard about the meeting preached by J. B. Daisley. This was in December of 1887, so he was still connected with the congregation that year. In 1886 Bruce Wolverton held a one week preaching meeting and in 1887 J.B. Daisley conducted a revival meeting and organized a congregation of 25 members. Mr. Wolverton was principal of the Public Schools at Dayton. The reader should see Mr. Daisley's own report on this meeting included in his profile. Pomeroy is the county seat of Garfield County. The new congregation met at the Jay Lynch store (15th and Main), the Methodist building, and then the court house. By 1889 the congregation was able to build. The photo is probably the original building pictured after the basement was developed. The congregation now has a modern facility. There is a map showing the counties of Washington State. Charter members included George Burnett, Mr. and Mrs. William Gammon, Mr. and Mrs. H. C. Thompson and Dr. Media Thompson. The first preacher was a "Brother Umphrey." This is probably W. D. Humphrey from Kentucky and Louisiana mentioned by J. W. Webb as being in Washington Territory, but planning on moving to Oregon in 1888. R. L. Lotz was the preacher in 1892. He left in mid-1894 to take the congregation at Moscow, Idaho. Under the leadership of N. B. Alley, a building was built at the southwest corner of 4th and High Street and dedicated to the Lord's cause. It was built prior to 1896. Among those sent into vocational Christian work are Derek Helt and Les and Marjorie VanDyke. (Marjorie was the great granddaughter of Moses and Mary Addington of Pine City.) The VanDyke family left a career in banking to attend Puget Sound Christian College and then work for the Lord in Zimbabwe. Prior to his death, Lester was on the staff of the Mesa Christian Church working with Seniors. The congregation has long been involved in outreach work, both in the Northwest and around the world. Their interests range from assisting Childrens Homes to Bible Colleges and overseas work. Peola is located 15 miles southeast of Pomeroy on Highway 128 near the Asotin County line. We can locate homesteads as early as 1874 and burials at Peola as early as 1878. By contrast, the Microsoft's Terra Server (an aerial photography system) shows only a few buildings in the former community. Most houses, the school, post office and businesses have been dismantled. The post office was opened in 1880 and closed in 1934. Peola was large enough that a church of 25 members reported their presence in 1892. The Christian Church was organized by Amos Buchanan in 1879. It may have had a building of its own. The preacher for many years was Jacob Hastings. About all that remains is the untended Pioneer Cemetery and one other very small untended cemetery.